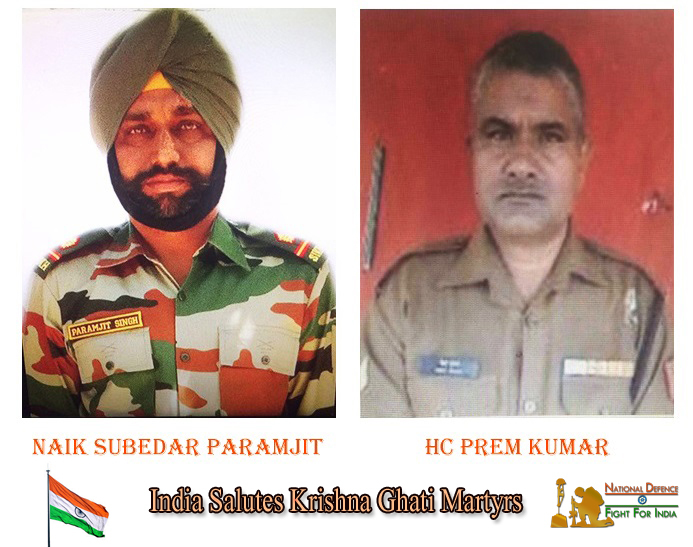 Pakistan Army in a barbaric act at LoC mutilated the dead bodies of two soldiers of Indian Army and BSF. In a press release issued later Pakistan Army denied the act terming itself a professional Army. Indian Army sources claimed to vow vengeance. Raksha Mantri, Arun Jaitley, condemned the attack and asked Indian Army to give befitting reply to the #ButcherArmy of Pakistan. The incident happened today morning when at 08:40 am Pakistan Army started RPG firing followed by mortar firing. Under cover fire, Pakistan Army’s Border Action Team (BAT) entered the Indian territory in Krishna Ghati Brigade area under 10 Battalion called as Anti Battalion or Nangi Battalion. The BATs hit joint patrolling party of BSF (5) and Indian Army (4), 200 meters inside the LoC. The area between the two Indian Posts is thickly forested and semi-mountainous about 700 to 800 meters where the BAT action took place. During the firing other members of Indian patrol retaliated in defensive fire. “The BAT team of Pakistan regular Army mutilated the bodies of two of our soldiers”, said an Indian Army Source. Indian Army confirmed the name of the soldiers as Naik Subedar Paramjit of Unit 22 Sikh (10 Brigade) and Head Constable Prem Sagar of 200 Battalion of BSF. Martyred N/ Sub Paramjit Singh belongs to Vainpoin in Tarantaran of Punjab. Martyred HC Prem Sagar is from Takenpur of Deoria district in Uttar Pradesh. Another constable Rajinder Singh suffered injuries in the left thigh. Indian Army sources claimed to vow for vengeance under a thought out plan while confirming the immediate provocative retaliation on the same line at the LoC. The retaliatory firing at LoC continued till evening and may be on. Another source confirmed that the Pakistan is at a dominating position (meaning at a higher altitude) where the incident took place. The latest Ceasefire Violation today is 65th this year all across 16 Corps of Indian Army and 5th in this sector. The highest CFVs reported in Naushera sector. Indian Army has killed 42 terrorists so far, 8 on LoC, 4 each in 15th and 16th Corps. Pakistan Army’s ISPR later in the day has released a press statement, which reads “Pak Army did not commit any ceasefire violation on LOC or a BAT action in Buttal sector (Indian Krishna Ghatti Sector)as alleged by India. Indian blame of mutilating Indian soldiers’ bodies is also false”. “Pakistan Army is a highly professional force and shall never disrespect a soldier even Indian”, the statement read further. Defence Minister Arun Jaitley also reacted to the incident later in the day. He said in an interview to DD News and ANI that, “Two of our soldiers in the Krishna Ghati sector in Poonch have been killed and their bodies mutilated by our neighbours. This is a reprehensible and an inhuman act. Such a attacks don’t even take place during war, let alone peace”. “Bodies of soldiers being mutilated is an extreme form of barbaric act. The Government of India strongly condemns this act and the whole country has full confidence and faith in our armed forces which will react appropriately to this inhuman act. The sacrifice of these soldiers will not go in vain”, he added. This is the third act of barbarism when Indian Soldiers bodies have been mutilated and; India yet to respond to barbarism in unequivocal terms. Meanwhile, Indian Army Chief General Bipin Rawat reached Kasmir valley on a scheduled visit today where he was briefed by Chinar Corps Commander on the prevailing situation in Kashmir at Badami Bagh.